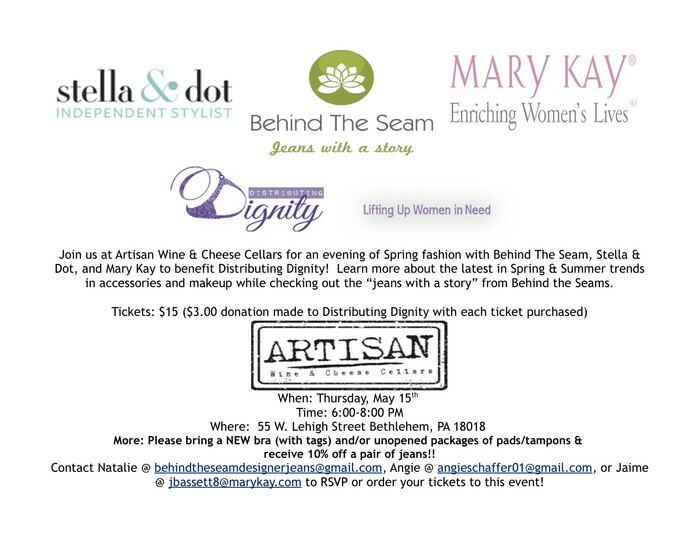 Join us at Artisan Wine & Cheese Cellars for a Happy Hour featuring Spring fashion with Behind The Seam, Stella & Dot, and Mary Kay to benefit Distributing Dignity! Learn more about the latest in Spring & Summer trends in accessories and makeup while checking out the “jeans with a story” from Behind the Seams. Distributing Dignity’s mission is to Distribute new bras, pads and tampons, enhancing the Dignity of women in need. To learn more about Distributing Dignity, go to http://www.distributingdignity.org/.